This event, organised by IWSN and The Schumacher Institute, was designed so attendees could learn, share and network with international researchers, practitioners and stakeholders in water systems and resilience. 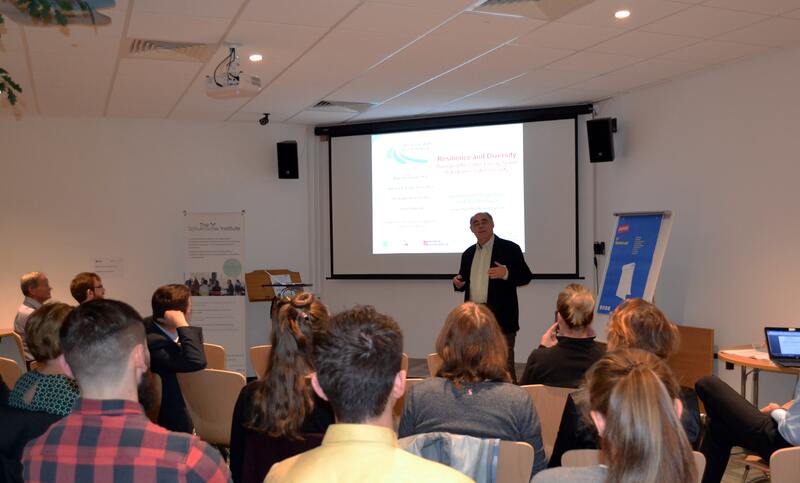 It was held at the Future Economy Centre in Bristol on 11 October 2016. Learn how water can fit into existing resilience initiatives (e.g. 100 Resilient Cities, etc.). Share new perspectives with international speakers. Define how to build water systems capable of resilient performance. Identify gaps and share ideas to set an innovative research agenda. Find partners for multi-disciplinary collaboration. Water (or lack of it) figures in many sections of the UK Cabinet Office Risk Register and yet it does not perhaps receive the attention it deserves as a critical vector of resilience. This may be changing, for some UK cities at least. Bristol has been recognised as a city at risk of both flood and drought impacts and the city’s recent designations as European Green Capital and as one of the Rockefeller 100 Resilient Cities have focussed attention on water and urban resilience. Resilience thinking looks for ways to enhance the ability of systems to succeed in a volatile, unpredictable, complex and ambiguous world. It is the potential to optimise performance under foreseen and unforeseen changes, disturbances and opportunities. It invites us to move beyond a ‘predict and withstand’ model, to one based on adaptation and reconfiguration, whilst retaining systems’ fundamental characteristics. New approaches are needed, approaches that might look quite different from the past (over)emphasis on heavy engineering (click here for some recent blogs discussing new approaches to resilience in water systems). Respond – Do we know what to do to manage water systems? Monitor – Do we know what information matters in water systems and their environment right now? Learn – Do we learn the right lessons from the right experience? Anticipate – How can we know what are important changes, disturbances and opportunities lay in the future?